Their craftmanship started from their elderly and was passed on from generation to generation. They lived in Bicol Region at the highland part of Guinobatan, Albay. Ms. Edna, during her younger years, watched her family doing handicrafts made from different indigenous materials available in their town. Gifted with pure talent and skills, she learned the process and trade secrets of making crafts, she began working in her family business and also honed her craftsmanship by accepting job orders from other suppliers. She enjoyed these things with her siblings and offered native products to tourist and visitor of their town. There came a time that she could not continue making crafts This was when she got married and had children, and she became so busy taking good care of her own family. Her husband, who was a farmer, also wanted her to give full attention to their growing children. After her chores were done, she would bring out her sketch pad and start doodling designs, so that eventually she created her own version of abaca angels and other abaca product lines. In 1991 she started designing nativity set for Christmas which were made of abaca scrunch, sinamay, twigs and other materials made from abaca fiber. She focused on making angels after she met with Intervida, a non-partisan, non-denominational and independent Spanish development NGO. This organization helped her, they sent her to seminars and trainings, they also coordinated with other groups who organized trade fairs. Intervida was able to invite those producers they were helping to join these events for free and with meal allowances. This gave way to more opportunities. From 2006 to 2009 she became active in joining trade fairs. She also joined cooperatives like the MAHAPA in Mauraro, Guinobatan to gain more experience and knowledge to run her own business, to learn first-hand the strategies of handling business finances through this organizations. In 2009 her husband died, and becoming widowed with 6 children she needed to be stronger, as she had to raise them on her own. 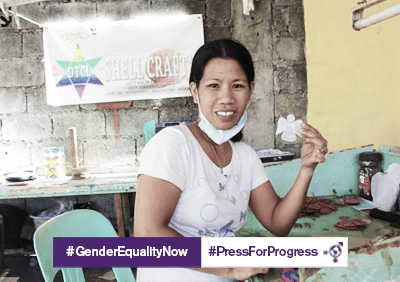 She then realized that her gift of handicraft making could help her support her children. She started securing her own Business Name, registering to DTI when the turn of events favored her and her family. In October 10, 2010 at 6pm at Kasanggayahan Festival, as she fondly tells the story to me, remembering every detail of how she met Mr. Loui Babia, the designer of Saffy, who bought samples from her. Loui interviewed her and showed interest in her abaca angels and other crafts that she could offer, so he introduced SAFRUDI and Saffy to her. She was then very happy, she was so confident that her designs and products would be patronized by Saffy’s buyers. She was right. From February to March of the following year 2011, she began the partnership of Velasco handicrafts and Saffy. 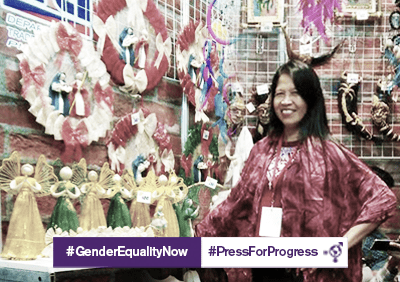 At present 13 families benefit from the orders placed by WFTO Buyers through Saffy to Velasco Handicrafts. The mothers of these families are the workers of Edna Velasco, she has also imparted her skills to her workers by teaching them basic angel making, understanding its raw materials and the importance of it to their lives. Ms. Edna is also active in the activities conducted by Saffy and committed in the practice of Fair Trading. This way, she could also play a big role in the improvement of the lives of her workers. She wanted them to grow alongside with her in meeting their shared goals. Aside from Saffy, Edna is also supplying to different buyers whom she met in Trade Fairs that she is attending. Aside from handicraft, she also operates a small local transportation business in her town. Through these, she was able to send her children to school and some of them already graduated from college and are now helping her in the finances of the family. She hopes and prays that more opportunities and support will come from the buyers and to continue to prosper our business relationships. She promises to develop more new designs and more innovative products that would fit the international market. Lastly, she would like to extend her gratitude to all the members and buyers from WFTO who never stop giving help to all the producers of developing countries like the Philippines. With determination, nothing is impossible. This principle in life made the 35 year old, Grace Sevillano succeed in her chosen field of work. She is a native of Pangasinan, a washer, gold duster and a layout artist. In the past, Grace worked as sales lady in a mall when she heard from her neighbor Zeny, who was then an employee of SAFRUDI, that their company was looking for new workers. Motivated by the need for financial security, she bravely decided to apply for her luck. Fortunately, she was employed by SAFRUDI. At first, she thought that working was an easy task. She even recalled how hard she started. She came to a point when she could not even finish a single craft. But hard work really paid off. With perseverance and determination, she was able to hurdle it. She stayed with the company for thirteen years until they were given the chance to be on their own. At the moment, she is with the DTCL Shell Crafts working with her former colleagues of SAFRUDI. Happiness and contentment are the reasons why she remained in the company. Because aside from having all the legal benefits that they offer, they also provide them with seminars and retreats. Likewise, they conduct reflection every Monday. These are all done for them to broaden their horizons. Moreover, the employer is generous to offer loans which she also uses in sending her 5 children to school. Finally, being with the Fair Trade is such a great experience. Granting the company with great orders is what she really wished in order for them to continually prosper in their endeavor.